Another Concept Sale, another Question & Answer session. Since last Friday, we’ve been collecting questions from the dedicated Q&A post here and today our designers working on the ship will answer 10 more questions for the community. We are very excited to discuss this ship in more detail, so let’s jump right into part 2! Named after the UPE military designation, the Prowler is a modernized version of the infamous Tevarin armored personnel carrier. Esperia’s astroengineers were given unmitigated access to study original versions of the ship recently discovered in the Kabal system to help meticulously reconstruct the vehicle. Now, the Prowler is the perfect fusion of two cultures: the elegance and effectiveness of the Tevarin war machine combined with the reliability of modern Human technology. Special thanks to Calix Reneau, Ben Lesnick, and Steven Kam for taking the time to answer these questions for us. Would it be possible for the loaner ship to be a 2.6 flyable Hoplite? Yes, we will assign the Hoplite as the loaner for anyone who purchases a Prowler concept ship. That’ll give you a chance to practice operations with your org mates while we build out the Prowler. What is meant by “its wide variety of defensive countermeasures at the ready?” This seems to suggest it has more or different countermeasures than other ships, is this the case? This indicates that the Prowler has the full range of countermeasure types: flares, chaff and decoys. Many ships have only one or sometimes two of these at a time. If the power or shields fail when the airshields are in use, will it cause sudden decompression? Yes, losing your airshields while in space would have the same effect as a hull decompression event. (Of course, fully losing power would also cause many other problems for a ship in flight!) Note that the cockpits are sealed from the rest of the ship, so it would be possible to continue flying despite damage to the barracks area. Does the Prowler have a bed/toilet? The Prowler does not currently have a bed or toilet, but we are still configuring the interior. There is a ‘ready room’ area behind the cockpits which could be used for this purpose, but that might be better served as an area to equip armor and store additional weapons and ammunition. Can the grav levs be reversed and attach the ship like a magnet to the hulls of other ships. We are still developing the systems needed for ship boarding, but the intent is to have the Prowler as a key boarding ship. This will likely use a variation of what you have described above, but we do not want to promise exact details until the boarding system is finished. Will the one-way glass be Tevarin ship exclusive, or is there a chance we can see this as a modular option for other ships as well? 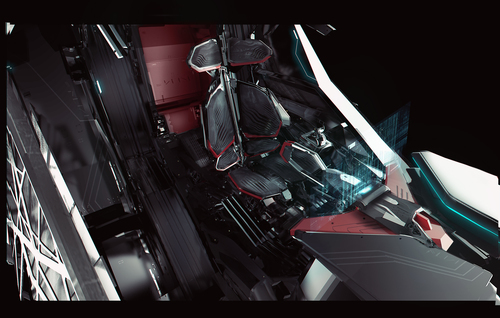 We are treating the ‘one way’ cockpit as exclusive to Tevarin ships for the time being; for now, we are going to consider it part of the ship hull rather than an individual component (meaning the ship was designed in specific ways in order to use it.) That doesn’t mean the Prowler will be the only ship that uses this tech, though… we’d love to further develop both their historical and present-day ship designs! Does the Prowler have any docking capabilities? If you mean ship-to-ship docking, no. That kind of boarding approach is not in line with Tevarin practice, which much preferred their airshielded Deployment Portals and elite training to optimize their effectiveness. Installing a physical docking hatch compatible with human standards of the time was not deemed a good use of the ship’s mass or internal volume budget. As per their philosophy, Esperia decided not to alter or diminish their Prowler’s experience and design choices by compromising other features in order to install a contemporary docking hatch. It takes the current shield allocation gameplay to the extreme to make sure all your baby chickens make it safely to the dance floor. Well, in all seriousness, let us revisit the description of the Phalanx Shield in the post: “A point defense shield that provides a very strong but limited protective face, the Phalanx Shield was one of the reasons that the Prowler became such a significant defensive force when flown in a squad with shields deployed and its wide variety of defensive countermeasures at the ready.” We have already indicated that maximizing your shield effectiveness for larger ships could be a dedicated job for a crewman. And some of you have also noticed in the lore that the Tevarin Phalanx shield has been depicted as being quite effective even against the UPE’s technologically superior weapons technology of the time, so it’s quite powerful if you use it well; but therein lies the rub – if you’re not managing it, you’re not using it well. We are still working on shield management systems in general, but that’s the goal – the Tevarin style Phalanx Shield is intended to be on the high end of rewarding player skill in shield management, but be even more skill-reliant than ‘normal’ shields. This is more of a physics question. With the Prowler being able to sneak up on large ships to deploy EVA troops, are there plans to allow crew members who exit a ship to retain their velocity? With the current unrealistic system of slowing down to a standstill after jumping into a friction-less vacuum, I feel it’ll be near impossible to board unless the captain of the ship is AFK. We spoke with John Pritchett who said the EVA friction is a bug. We do plan to address this bug at some point. Of course, even if you retain velocity upon exiting a ship, that by itself doesn’t necessarily make boarding another ship at speed easy, either. We’re as interested as you are in seeing just how good you can get at it – and under what conditions. Does the UEE use any of the Tevarin themed ships officially? 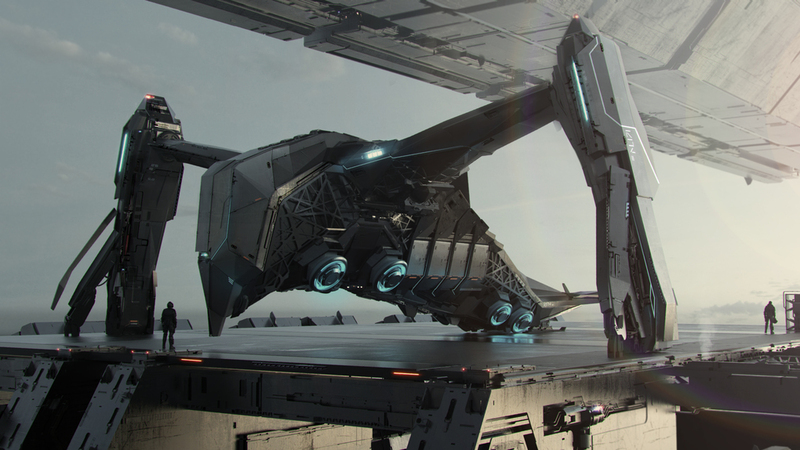 The UEE’s dropship needs are met by the various options provided by standard military contracts with Anvil, Aegis and other suppliers of related equipment. That’s not to say that the Prowler is not utilized for training purposes and special ops, but currently they are not used on a massive scale.